The vast majority of taxi and private hire car (minicabs) companies and their drivers operating today are fully licensed, honorable, reliable and safe to travel with and many will be based near you. Just take time choosing the right one for you but remember if your gut feeling tells you something seems wrong then don`t get in the car and chance it, simply call 500 Cars 01189599999 and book another one so you can arrive home safely. Booking a taxi, Only use licensed taxis and minicabs!! Always try to pre-book your taxi or minicab in advance with a company you know and trust and have used before or book a company with a website (www.500Cars.com) so you can tell a family member or friend which company you will be travelling with and what their contact details are. Ask the company you have booked with to text you or tell you the registration number of the taxi or the license plate number or name of the driver they are sending to pick you up so you know you are getting into the correct cab. To make sure another customer looking for a taxi outside a busy venue does not get into your pre-booked taxi, you could give the taxi company operator your name and mobile and request a text back. We will text you your drivers name, vehicle and license plate number, by doing this you know he is your correct driver and he will know you are his correct passenger. If when looking for your pre-booked taxi outside a club or bar you are asked by a waiting unknown cab driver what your name is, don`t tell him - instead ask him what`s the name of the passenger he is supposed to be picking up and what destination is he supposed to be travelling too, if it`s not your name and destination don`t get in. If you have not pre-booked a taxi call and book one at 500 Cars 01189599999 or try to use a taxi rank with taxi marshalls in attendance as they offer a reassuring presence to passengers. If you can`t book a cab from a reputable company when going out nominate one of your group as a designated driver for the evening or ask a another friend to drive you or you could ask a relative or good old mum and dad (Sorry mum and dad`s) but it`s better to be safe than sorry. WARNING: If you have to make a telephone booking in a public place do not let anyone hear you giving your name or address as anyone can turn up and pretend they are your taxi. Make sure your mobile phone is fully charged before you go out and has credit on it. Make a note of the number plate and drivers license number on the back of the car. Always sit in the back of the vehicle! Carry your mobile phone in your hand so it is easily accessible. Watch which route the taxi driver is taking and if he is going the wrong way challenge him. If in doubt don`t get in the taxi! call and confirm, or just request a different Taxi. Question: What type of taxi can be hailed down in the street? Only licensed hackney carriage vehicles that are operating in the area in which they have been licensed can be hailed down in the street or operate from taxi ranks. 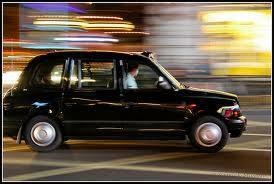 They are London black cabs (like the ones in the pictures) or a people carrier with a roof sign saying Taxi. All licensed taxis will have a local authority licence plate fixed on the back of their vehicle showing their licence number. If the vehicle does not have one don`t get in. 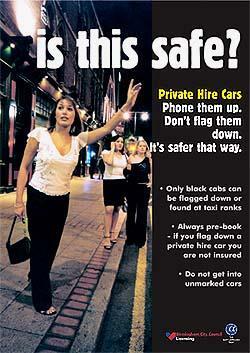 Private hire vehicles (minicabs) - who can they pick up ? Private Hire Vehicles (Minicabs) are only allowed to pick up passengers who have pre-booked by telephone 01189599999 or by email info@500cars.com or by visiting a minicab office. It is illegal for a private hire vehicle to pick up a passenger if hailed down in the street. All licensed Private Hire Vehicles (Minicabs) will have a local authority Private Hire licence plate fixed to the back of their vehicle, some Private Hire vehicles also have stickers on the side of their vehicles or a roofsign saying Private Hire, Advance bookings only.